Gra continues to enjoy tours with the Royal Navy, but on this occasion the 1991 Gulf War overshadows events. There is no postmark on the card, but Gra has helpfully dated it. The stamp is commemorating the artist Raphael, but I cannot find any other information about it – can anyone else help? Amidst all the excitement Sara has still found time to drop me a postcard – the style of writing suggests a very hectic time. Simon, my husband, comes from Cornwall, which is why she’s thought of us. 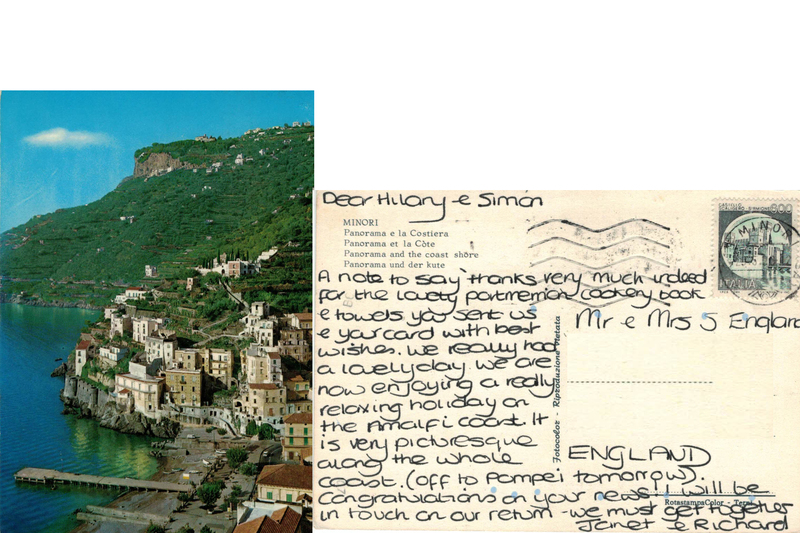 The postmark is very blurred, but I believe that it is dated 22.06.05 The other blurred postmark is asking us to ‘Please print the postcode’ – something which Sara has ignored on this occasion, and the card still arrived safely! Italy again! Towards the south of the western coast this time. A great status update which includes a description of the area, a bit of news and some good wishes. The card is postmarked ‘MINORI’ and carries a 600 lira stamp featuring the beautiful Castello Scaligero-Sirmione from the 1980 definitive series of castles and strongholds. Here’s Janet again; she had just married Richard, hence our gift. We had just made public the fact that we were expecting our first child, hence her congratulations 🙂 Janet is still married to Richard; and Janet and I continue to be in regular communication. 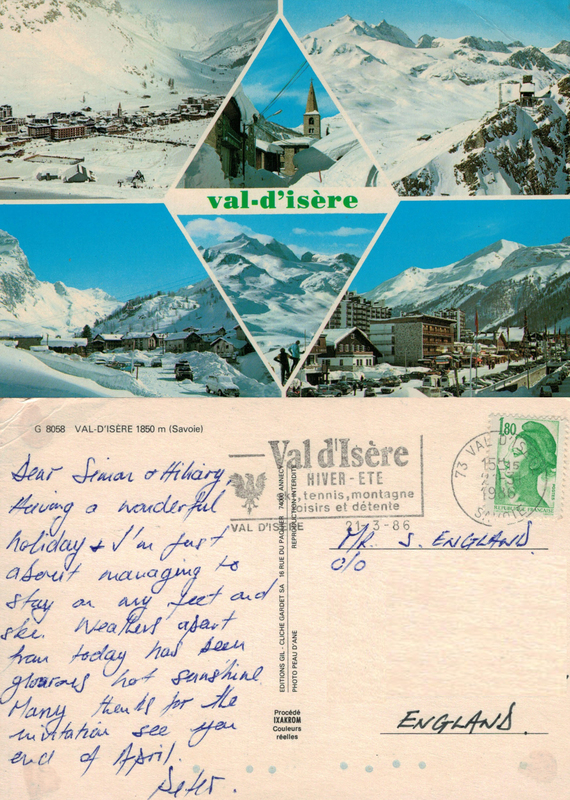 Post marked ’73 Val d’Isère Savoie 15H 15 21-3-1986′ and ‘Val d’Isère HIVER-ETE Ski, tennis, montagne, loisirs et detente’ promoting the leisure and relaxation that can be enjoyed in the area during winter and summer. Val d’Isère is one of the most popular ski resorts in the French Alps and Peter’s upbeat status suggests that he certainly enjoyed his visit!